Music Explorer Musical Toy is rated 4.7 out of 5 by 23. Dimension (in) 8.5" x 8.5" x 2.5"
Rated 5 out of 5 by Emilyk from Great for babies and toddlers! My 2 year old started using this toy and he loved the sounds of the different instruments. Now my 7 month old is crawling and loves to touch all the sides and see the lights and sounds. 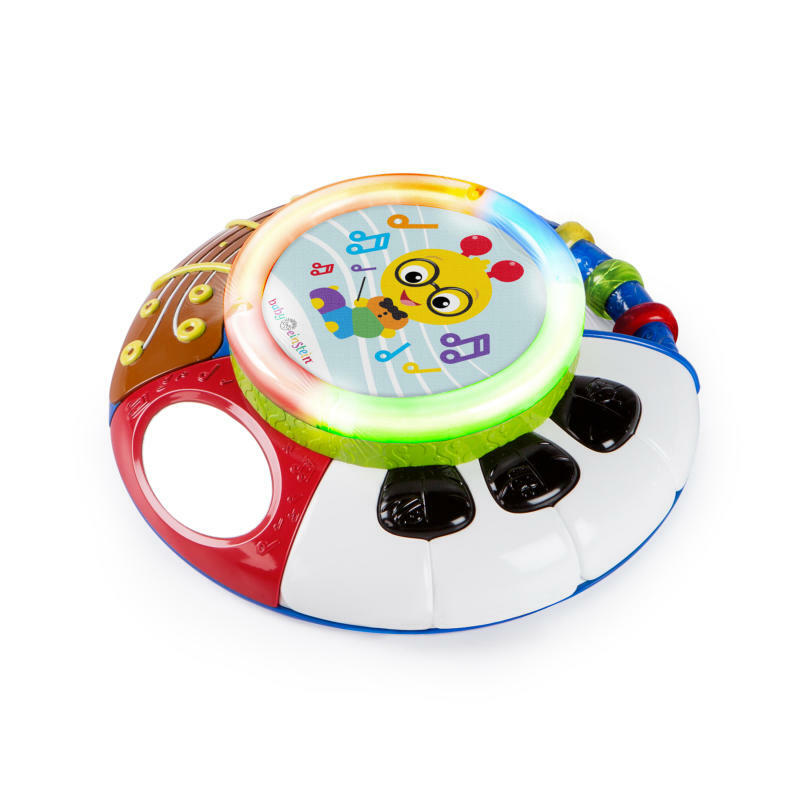 Rated 5 out of 5 by Beautycole from None stop fun My 6 month old won’t stop playing with this music explorer. He loves the drum part and all the different tunes. Rated 5 out of 5 by Cobainian from Super cute toy! My son and I both love Baby Einstein, and this toy is so cute! It’s not too big, which is nice because we all know how much space a little baby can take up with all their stuff! This toy is a favorite of my 3 month old, and I’m sure he’ll like it even more as he gets a bit older. My favorite part is the soft drum in the middle. Rated 4 out of 5 by Rossed from Entertaining toy My 11 week old loves looking at the flashing lights during tummy time. She lifts her head towards the sounds and looks at the light. She isn't old enough yet to purposely play the sounds but I think she will enjoy it when she is. Rated 5 out of 5 by R Hall from Great features and durability! My infant loves this toy! It keeps her busy longer than any of her other toys. Shes played with it, drooled on it, threw it in the floor and it just keeps on working no problem! Rated 4 out of 5 by Lm124906 from Cute toy My child absolutely lovea this toy. It keeps his attention well and is very flexible and sturdy. It has been thrown and dropped multiple times without breaking. I love that it is all about music and has several different activities on it. I would recoomend this to other parents.